Fluid architecture of native limestone and heavy timbers, a soaring ceiling with a suspended glass sculpture evoking the region’s topography, and flowing indoor and outdoor leisure pools define Tom Muehlenbeck Center. 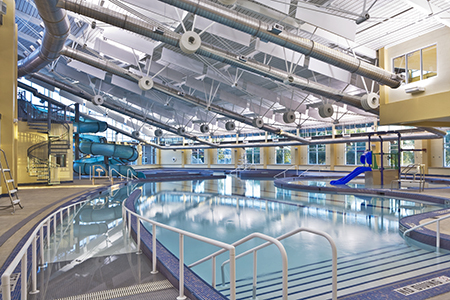 Designed by Brinkley Sargent Architects, Mesa Design Group, Moody Nolan, and Counsilman-Hunsaker, the natatorium complements the center’s flowing architecture with sweeping views inspired from an adjacent wetland creek, one of the shaping forces of the project. 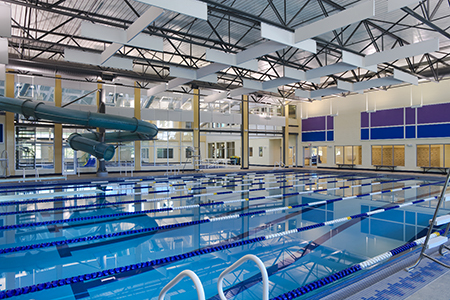 A 25-yard eight lane indoor lap pool with on-deck seating provides competitive aquatics. 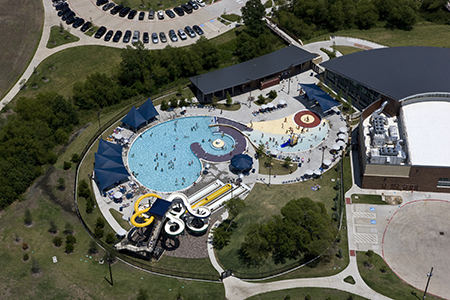 An outdoor free-form leisure pool maximizes a strong visual connection between the inside and outside bodies of water.